Authentic tanzanite gemstones will take the stage with Apples of Gold Jewelry's unique three-stone oval tanzanite ring! The oval cut tanzanite gemstones, which are a beautiful violet blue in color, glitter when set into a .925 sterling silver ring. The three stones measure 1.15 tcw, and the versatile design of the ring makes it ideal as an engagement ring or a ring to add to a bridal collection or wear alone. The smoky bluish purple tanzanite stones make a perfect gift for gemstone lovers! 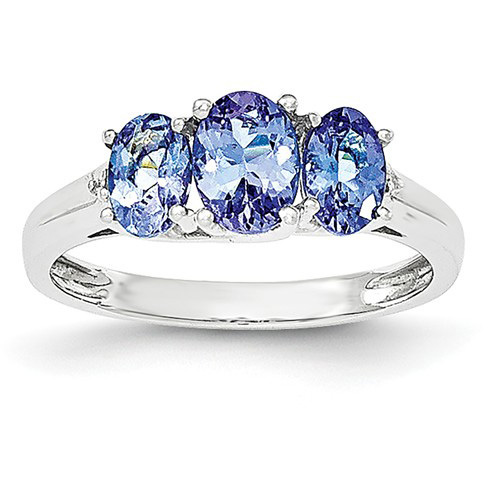 We guarantee our Three-Stone Oval Tanzanite Ring in Sterling Silver to be high quality, authentic jewelry, as described above.